Article: How can you make your employee’s first day memorable? How can you make your employee’s first day memorable? According to a report, 90% of businesses believe that employees make their decision to stay with their company within the first year of employment. And, the first day impressions are sticky. Hiring is the most challenging job for a manager be it in the junior or at the senior most position. You have to sift through countless CVs and profiles, shortlist the few that are almost fitting the requirement and then a series of interviews before you the match is done. And, you pronounce the words, “You are hired!” It takes months or in some positions I’m aware, weeks or years! It’s quite daunting for a new employee to walk into an office where except for 2 – 3 people, they don’t know anyone. It is overwhelming How special can you make it to wow them? 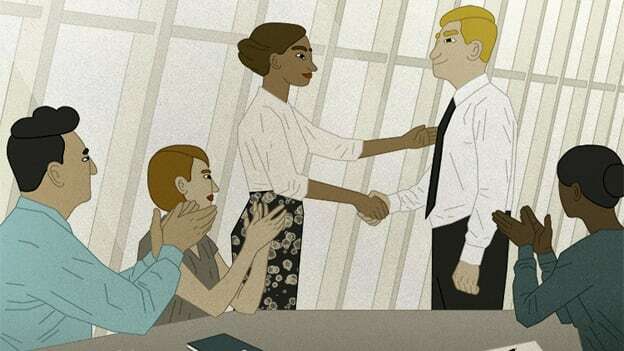 How do you take the exciting energy of the interviews and meetings ahead to make the new employee feel a part of the corporate family, to feel that they are cared for and, truly belong? According to an Aberdeen report, 90% of businesses believe that employees make their decision to stay with their company within the first year of employment. And, the first-day impressions are sticky. There a few ways some organizations make the onboarding experience memorable and special. Sending a small video of the employee to the others that showcases their professional experience, announces their title, role and which team are they in. Highlights some interesting, fun facts and hit the right chord in making them be seen as qualified for the role as well as in getting to know them beyond their role. It can serve as an icebreaker and connect those with common interests. One of the things that top this list, is to greet them in person. Employees generally, come in early on their first day so be sure to arrive before them. Make sure your security staff gives them a warm welcome, too and directs them to you. It takes away the nervousness and instills confidence in them. Remember, they are unfamiliar with the geography as well as the protocol of the organization. A welcome like this sets them at ease. Have all things organized beforehand cuts meaningless logistics issues – the laptop, phone list of key personnel that they will be interacting with, email access, office supplies, screensavers welcoming them. Presenting them with a welcome gift such as funky t-shirts, coffee mugs or notebooks or balloons and chocolate boxes can make the day memorable. Have your new employees fill these out, electronically if possible before their start date. This saves valuable time and allows you to maintain all necessary documents, safely in one place for use in the future. In case, there are forms to fill out, seek time well in advance and keep all the paperwork ready for the employee to fill them out with ease. Having your team involved in the onboarding process helps, since, your new employee will be working closely with them. Ensure training responsibilities are shared amongst team members instead of pulling one resource for the entire day. Planning a team activity on the first day is a great way to bond, casually and help the new employee in getting to know the team. A team lunch or an after-work happy hour are a couple of ways to build strong relationships. Assigning a buddy or mentor helps the new employee to have a go-to person for any query they may have. The mentor knows the ropes and can guide them to assimilate into the culture faster and can be an effective source of advice and encouragement. Mentors have a great deal of influence on the new employee, so choose him/her well. Nothing connects better than stories when you need to share the company’s values or culture. Share unique things about your company that new employees should know – such as, the history, attitude towards community service, awards, etc. Perhaps a fun and illustrative company culture guide could be handed out to the new employees. This makes new employees understand how to work, cohesively and contribute within the team. While you may be tempted to have the new employees dousing fires as soon as they walk through the door, it’s wise to get them to settle in and allow the transition to seep through by slow diving them and allowing them the space to engage better. Have the new employee meet people at all levels of the organizational chart. This helps your new hires gain a big-picture understanding of how everyone contributes to your company’s mission and how they will belong. At the end of the day, be sure to have a moment with the new employee to answer any questions they may have. Touching base with them is likely to make them feel supported and gives them the opportunity to spend time with you and let you know how they’re feeling. How about sending pictures taken on the first day to the spouse or parents so they feel connected to the organization as well. It doesn’t cost much, however, the impact is indelibly strong in sending a message that you care. Recording a short thank you video from different members of the team is a simple, effective way to help new hires feel welcome and get the family to know the new colleagues. Inject fun and engagement to wow your new employees. It lays the groundwork in making them feel like an important and valued member of your team and plays a big part in getting them to stick around longer. I would love to hear ideas that may have worked well for your organization.